Today is the 141 anniversary of Andersen , father of fairy tale. He passed away on August 4th, 1875, at the age of 70. During his lifetime he was acclaimed for having delighted children worldwide, and was feted by royalty. His poetry and stories have been translated into more than 150 languages. They have inspired motionpictures, plays, ballets, and animated films. Born in the small town of Odense, Denmark in 1805, Andersen's life was not easy. His father was a sickly man and his mother washed clothing for a living. His mother wasn't highly educated, but because she was superstitious, she introduced Andersen to folklore. This encouraged his love of stories, plays, and the theater at a young age. These hobbies, which were combined with Andersen's love of literature, eventually helped him become a famous writer. 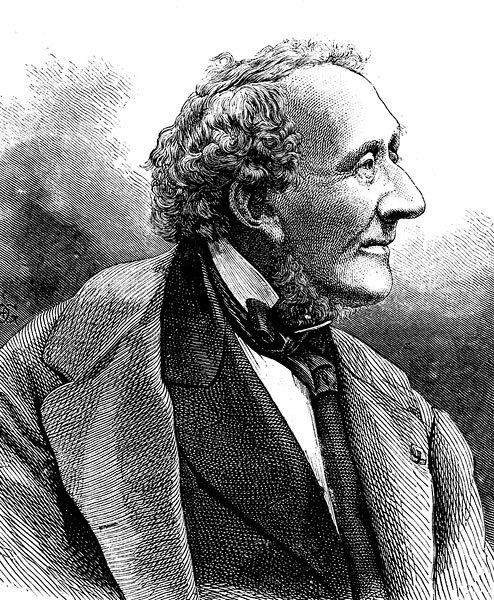 Andersen was forced to start working after his father passed away in 1816. For a time, he worked as a tailor, and then in a tobacco factory. At 14, he moved to Copenhagen to become a singer. However, after his voice changed, a director at the Royal Theater arranged for Andersen to go back to school. Andersen began his writing career by writing plays and poems for a local journal. Then, in 1835, he broke into novel writing with The Improvisator.The plot of this novel is the basis of many of Andersen's works. In general, Andersen's stories are mostly about a main character who has to face many problems while he or she is pursuing happiness. Despite his success in novel writing, it was children's tales that eventually brought Hans Christian Andersen fame. 1. Nothing is too high for a man to reach, but he must climb with care and confidence. 2. To be of use to the world is the only way to be happy. 3. But a mermaid has no tears, and therefore she suffers so much more. 4. Every man's life is a fairy tale written by God's fingers. 5. Death walks faster than the wind and never returns what he has taken. 6. Life is like a beautiful melody, only the lyrics are messed up. 7. Happy domestic life is like a beautiful summer's evening; the heart is filled with peace; and everything around derives a peculiar glory. 8. Where words fail, music speaks. 9. To move, to breathe, to fly, to float, To gain all while you give, To roam the roads of lands remote, To travel is to live.